CANEGROWERS joined a coalition of conservation, community and farming organisations urging a July meeting of the Agriculture Minister's Forum to escalate efforts to eradicate red fire ants. State and Federal Agriculture Ministers responded with a 10-year, $411.4 million plan which will effectively double surveillance and treatment activity. Queensland Agriculture Minister Bill Byrne said the plan would be implemented as a priority in Queensland with an expanded treatment program starting in September. Mr Byrne said all states and the Federal Government had agreed it was in the national interest to eradicate fire ants due to the potential impacts these invasive species had on Australia’s economy, environment, public health and lifestyle. “If left uncontrolled, the impacts of fire ants in Australia have been estimated to be between $5.3 billion and $45 billion over 20 to 70 years,” he said. Ahead of the Forum meeting, CANEGROWERS had signed an Invasive Species Council open letter calling for the commitment and joined a social media campaign to raise awareness about the pest. 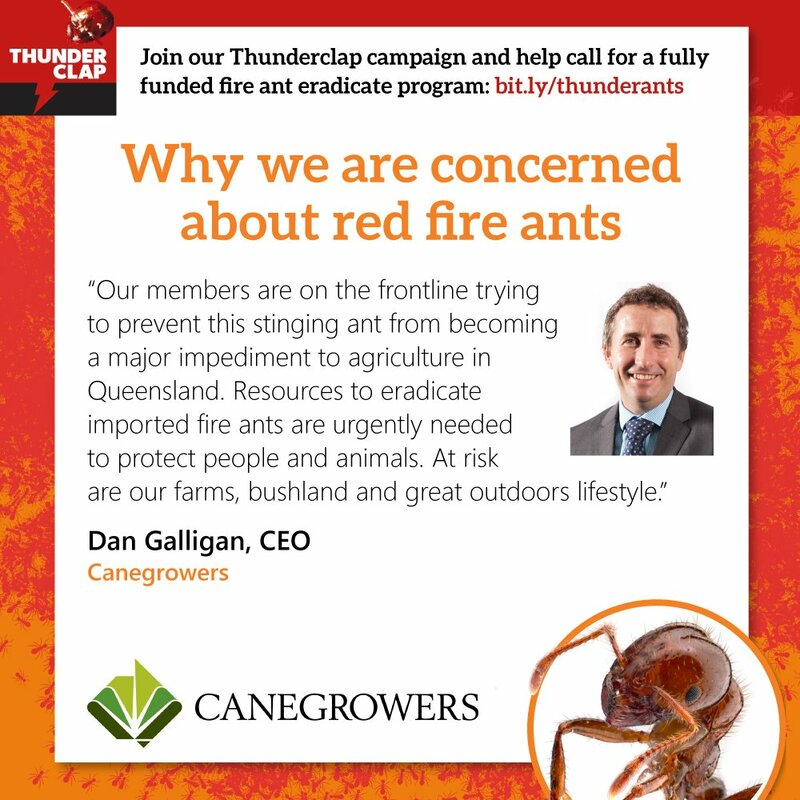 “Our members are on the frontline trying to prevent this imported pest becoming a serious impediment to agriculture in Queensland but they are being let down by an overstretched State Government capability,” CANEGROWERS CEO Dan Galligan said. Cane growers in the Rocky Point district have reported more than 300 suspect fire ant nests to authorities to June 2017. “But they are waiting up to 60 days for an inspector to arrive to look at the nests,” Mr Galligan said. “Their calls for help are sitting in a big pile of backlogged reports. "This is unacceptable when you are dealing with an invasive species that has the potential to kill people and animals. Species Council’s campaign. This is a national issue and not one Queensland can tackle alone." Mr Byrne said the first treatment progam under the new plan would focus on the high risk infestation areas. “Biosecurity Queensland will be communicating with residents and businesses in these areas before and during the treatment season," he said.